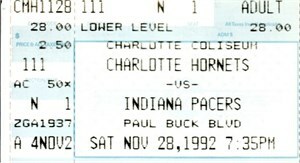 Original ticket stub from the Nov. 28, 1992 Charlotte Hornets vs. Indiana Pacers in which Reggie Miller scored a career-high 57 points. Rookie Alonzo Mourning scored 30 and his SkyBox Rookie Card is reproduced on the ticket. HAS MINOR CREASES AND OTHER FLAWS/WEAR. ONLY ONE AVAILABLE FOR SALE.